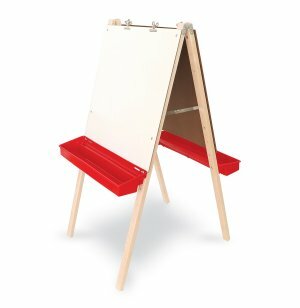 Encourage young artists to express their creativity with an Adjustable Art Easel for kids. 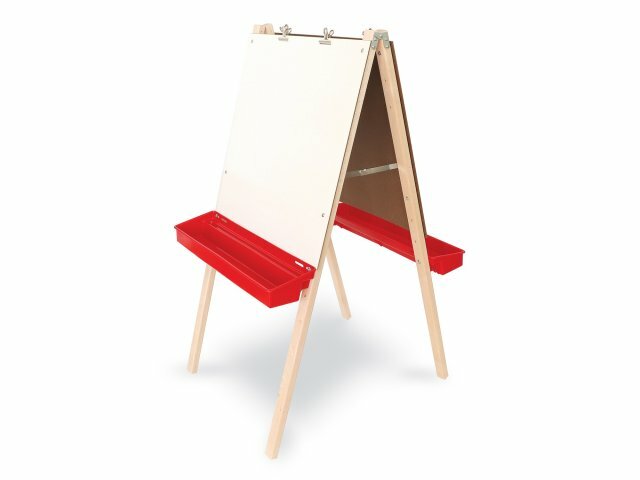 These double-sided easels enable two children to enjoy coloring, drawing, or painting at the same time. Each side features a dry-erase board and two clips to hold papers firmly in place. Plastic trays keep crayons, markers, paint, and glitter in an accessible place, so children can keep supplies within reach and not on the floor. Art easels make young artists feel like the professionals. Adjustable height accommodates children from age three and up. Tough materials ensure that young artists will enjoy many years of creative exploration with these kids easels. Heavy-duty hinges on sturdy hardwood legs facilitate stable standing, and enable the easel to be folded when not in use. Whitney Bros. started out in 1904 by manufacturing safe and sturdy educational toys. Today, they are a leader in developing versatile and 100% child-safe furniture and storage systems for schools and day-care centers, including their highly innovative changing stations. Double the Fun: Each side features a markerboard and two clips for secure paper holding. Easy Access: Plastic trays below the drawing surface keep crayons, markers, and paints within reach. Adjustable Height: Easel height can be adjusted from 46" to 48" to accommodate children ages three to six. Tough Materials: Built with heavy-duty hinges on sturdy hardwood legs for secure standing and easy folding.